This unique design will ensure passers-by take a second look. An arched entryway echoes the decorative keystone atop the window, while sweeping gables and a stone facade add drama to the exterior. A tray ceiling and bay window compliment the master suite, which also features walk-in closets and dual vanities in the bath. The lofty living room overlooks a rear deck and gracefully flows into the dining room and kitchen. Hugged by a bay window, the breakfast room includes a walk-in pantry and looks out onto a screened porch. The lower-level family room opens onto a covered patio. 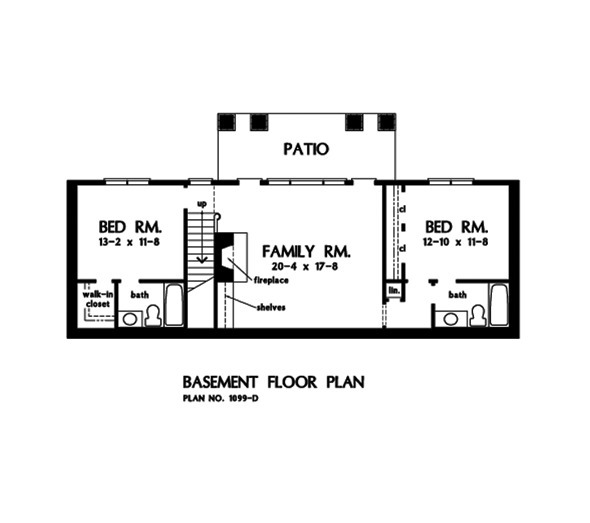 Featuring a second fireplace and built-in shelves, the walkout basement also includes two bedrooms with full baths. 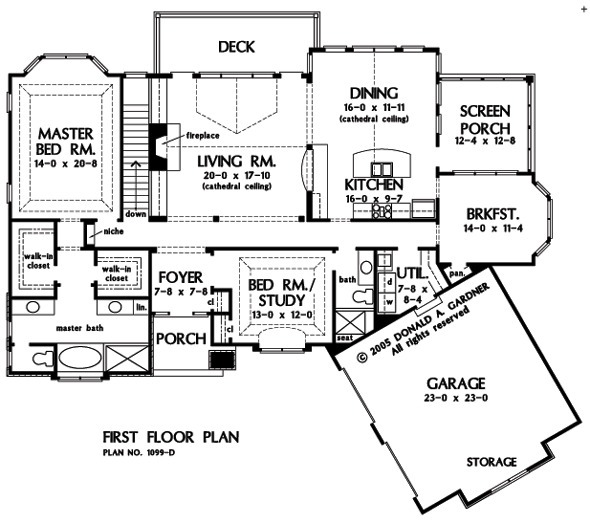 1st Floor: 2143 Sq. Ft.
Porch - Screened: 156 Sq. Ft.
House Dimensions: 73' 9" x 60' 0"
Great Room: 20' 4" x 17' 8"
Master Bedroom: 14' 0" x 20' 8"
Foyer : 7' 8" x 7' 8" x 10' 0"
Dining Room (Cathedral): 16' 0" x 11' 11" x 17' 8"
Great Room : 20' 4" x 17' 8" x 9' 6"
Kitchen (Cathedral): 16' 0" x 9' 7" x 17' 8"
Breakfast Room : 14' 0" x 11' 4" x 9' 0"
Utility Room : 7' 8" x 8' 4" x 9' 0"
Garage Storage : 2' 0" x 12' 0" x 0' 0"
Master Bedroom (Tray): 14' 0" x 20' 8" x 10' 6"
Bedroom / Study (Tray): 13' 0" x 12' 0" x 10' 6"
Bedroom #3 : 13' 2" x 11' 8" x 9' 6"
Bedroom #4 : 12' 10" x 11' 8" x 9' 6"
Porch - Front : 7' 8" x 6' 10" x 10' 0"
Porch - Screen : 12' 4" x 12' 8" x 9' 0"
Deck / Patio : 21' 4" x 8' 0" x 0' 0"
Living Room (Cathedral): 20' 0" x 17' 10" x 17' 8"
Other : 21' 9" x 8' 3" x 9' 10"